This residential development uses simple timber-clad blocks and thoughtful landscaping to create good new communities. This former industrial zone south of the city centre now contains 30 homes in 4 blocks by LAN. 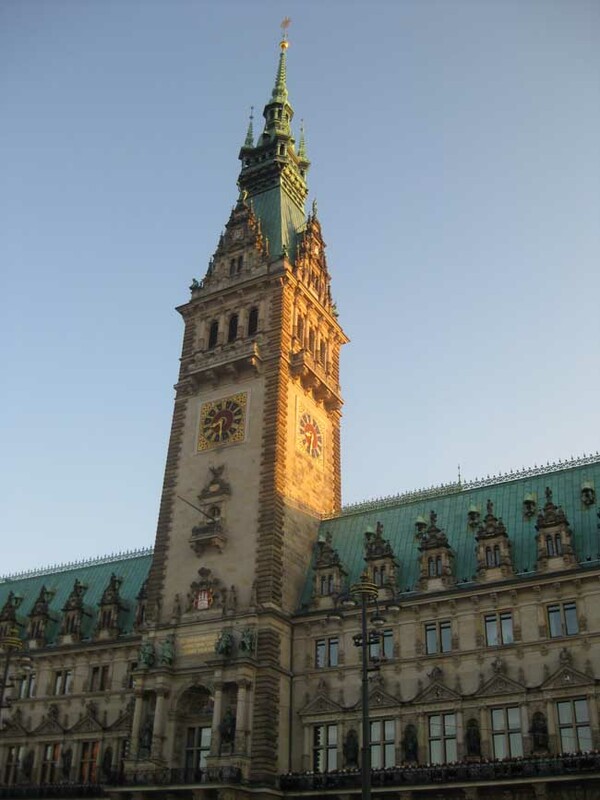 In October 2008, LAN won first prize in an international competition for design and building organized by IBA Hamburg 2013, an international construction exposition first held in 1901. IBA Hamburg is more than just an architecture “show.” It strives to be a true laboratory for architectural, urban, social, and political ideas and initiatives that yield new ways of building cities and living in them. Wilhelmsburg, where the project is located. The first competition phase was to design a development that would then become a Bebauungsplan (the equivalent of a PLU, or development plan, in France). One year later, in 2009, the award winners unveiled their architectural project for a housing block. This public presentation was organized by IBA to attract interested parties and to then establish Baugruppen, development groups made up of private citizens who wanted to build their residences together, and who held the role of project managers. The outgrowth of his meeting was the formation of a Baugruppe made up of approximately 20 homes, which opted for LAN’s project for 3 housing blocks; the group was then enlarged to 30 homes in 4 blocks. The architectural studies were completed in July 2010, and the construction permit was filed in December. The worksite opened in September of the following year. The four housing blocks were delivered on an ongoing basis between October 2012 and March 2013, just in time for the inauguration of IBA Hamburg 2013 and the IGS (Internationale Gartenschau, an international exposition devoted to landscape architecture), both of which drew many visitors to the site. This housing design, which occurred within a unique framework – IBA Hamburg 2013 – draws on Hamburg’s architectural heritage by providing a contemporary, updated version of the traditional Terrasse, a “row-house” type of worker housing. The first challenge in conceiving our master plan was how to integrate cars into the Terrasse, especially how to limit their impact and place in the public spaces. To do so, we scaled the width of the street a minima (6 meters of the 13 meters between the buildings facing each other) and we made its pathway as slender as possible to slow down traffic and to give the center a vegetation-oriented feel. The covered parking spaces were grouped at the corners of the buildings in order to create a direct and necessary relationship between the ground floors and the public spaces. The enclosures separating the private spaces facing the street were removed, and all the green spaces received the same treatment so that the local residents could truly appropriate them. Two public spaces run through this area, tying the street to its surrounding environment, which consists of a park, a brook, and a pond. In designing the housing models, we opted for U-shaped volumes in order to increase the intimacy of the yards and to accentuate the connection with the park located to the east. Through its creation of interiorities and angles, the new housing block defines three kinds of socialization: public, by facing the street, collective, with yards shared and maintained by the residents, and private, by means of the yards and terraces bordering the apartments. The themes of the individual home, the car, the definition and prioritization of public and collective spaces, as well as environmental quality, have here been reinvented in order to produce a new, sustainable urban model. One of the architectural project’s ambitions was to adapt the residences to the current and future needs of the families. We also wanted to combine the advantages of the Terrasse and the “rowhouse,” between a homogeneity of the whole and by asserting singularity. The way we shaped and configured the space yielded a vocabulary that gave each building its own identity while at the same time preserving the harmony of the whole of the four housing blocks entrusted to LAN. Due to their U-shaped configuration, the housing blocks have a central courtyard consisting of individual terraces bordering the residences, and a central green space landscaped according to the residents’ preferences. The composition of the façades changes depending on their placement. Facing the street, narrow glass doors create a consistent rhythm, and facing the courtyard, three large picture windows, stacked one on top of the other, provide ample views and exposure to sunlight. The wooden siding changes from one block to the next; there are variations in the direction and size of the wood planks. Similarly, the color changes in the window and door frames and the coping in aluminum, as well as for the awnings. The parking spaces located at the corners are fully integrated into the buildings. The absence of enclosures and a similar treatment for the yards facing the street allows them to blend into the landscaped public spaces, which thereby creates the sensation of a large, continuous pathway. Each housing block has 6-10 residences. The buildings also contain individual storage rooms and a common space that hosts the Baugruppe’s communal activities (general meetings, parties, arts and crafts workshops, etc. ), and welcomes visitors. Within the blocks, the 33 housing units are of two kinds: “row-house” and “multi-level” units. The 13 “multi-level” units occupy 1 or 2 levels, and are 50-90 m² in size. They each have direct access to either a garden with a terrace, or to a loggia. The ground floor residences are fully accessible and usable by persons with reduced mobility. The 20 row-houses have three floors and a private yard with a terrace facing the street and one facing the courtyard. Their orientation and surface area vary depending on their positioning within the block: east-west or north-south, between 120 and 160 m². Workspaces have been integrated into the housing at the residents’ request; there are offices, graphic design studios, therapy rooms, and so forth. Other spatial elements, such as a hopper between the ground and first floors, the positioning of the stairwell, the entry into the kitchen, the number of bedrooms and bathrooms were chosen by the residents. In conclusion, the variations in the constructions, the programs, surfaces, and the material finishings reveal the potential of the typology that was created, and they bear witness to its wealth. The neighborhood has remained very consistent in terms of its architectural vocabulary, and yet, each residence is unique. During this project, LAN dealt with two successive commissioning entities: IBA Hamburg 2013 for the urban planning phase, and then the residents themselves, via the Baugruppe, for the architectural phase. The direct result of this change in principals was the multiplication of the number of clients and, therefore, interlocutors: from 1 to 80 persons. How does one manage the complexity inherent to such an increase? How does one work at the neighborhood level, with the 80 members of the Baugruppe, and in terms of each individual habitation, on each of the 33 residences? How does one adapt one’s approach and working documents to clients whose knowledge of architecture is extremely disparate? The architectural phase seemed to be both an impossible task, because the intentions of the various Baugruppe members were contradictory and created clear divisions, and at the same time, an exercise in fostering architectural awareness, where pedagogy and diplomacy were both de rigueur. Between July 2010 and December 2011, fifteen general meetings were held with the Baugruppe, LAN, and a mediator. These meetings were rounded out by 3 collective workshops on the layout of the homes, the façades, and the planning standards for the housing units, as well as by individual meetings with each family. Decisions were taken both during general meetings by majority vote when the concerned the whole project (layout of the housing units, façades, fluids, planning standards for the units, etc.) and directly with each family if they only concerned the individual unit. For their part, the future residents created a blog and Twitter account of their own accord. Initially created to attract other interested subjects to complete the group, these interfaces were then used to post updates on the project and the construction, and to promote this adventure. For that matter, some of the residents have told us that they still receive many requests for participation. The Baugruppe today is classic form of co-ownership. In terms of the construction, we opted for a shell structure (cement and block, or Kalksandstein-Mauerwerk), which guarantees good acoustic insulation, and wood-frame facades. The panels were built in a workshop and measure up to 9×3 meters. They combine a wood frame, Douglas Fir siding, solar protection in the form of external textile awnings, as well as exterior joinery in colored PVC and triple-glazed windows. 20cm of cellulose insulation was blown into the wood frames in order to fill the empty spaces between the block walls and the siding. The final energy consumption goes up to approximately 40 kWh/m²a, and the primary consumption is 25kWh/m²a. A shared heating plant is located in Building 4, and the heat is then distributed to the other buildings via an underground system. The cogeneration heating (electricity and heat for hot water and heating) is of the Lichtblick Zuhause-Kraftwerk type. Each housing unit has double-flux ventilation with recovery of individual heat. Rainwater is collected in the yards and empties out into nearby canals. Team: LAN (mandatory architects): Umberto Napolitano and Benoit Jallon, Sebastian Niemann (lead architect), Vincent Vaulot, Peter Balzer, Remi Carteron (competition). February 3, 2010 in Hamburg.